This is a highly drinkable abocado (almost dry – just a hint of sweet) pedro ximenez oloroso by Perez Barquero of Montila Moriles. As you can see it is a beautiful orangey chestnut in colour. On the nose it is sweet, rum and raisin icecream. Then in the mouth a lovely mellow structure of aged, roasted caramel. 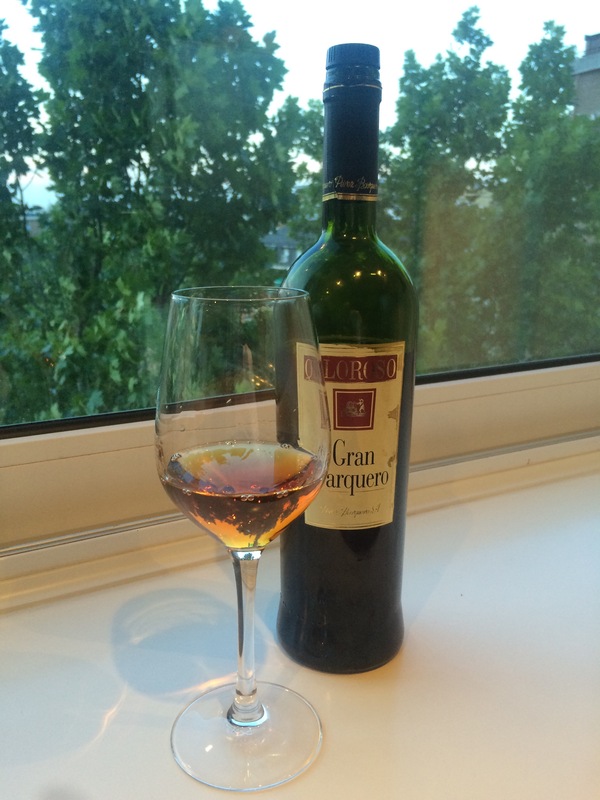 I really find that PX works well in an oloroso – its glycerol richness in the mouth really complements the flavours. Conversely, of the PX wines olorosos or amontillados work better, imho, than finos due to their structure – the PX just doesn’t seem able to carry off the subtleties of fino like palomino can. If I were to criticize (and I might as well while we are here) it would be that PX oloroso’s don’t quite develop as much acidic zing as their palomino cousins from Jerez (in fact there is probably a little leas intensity in general). This wine has a nice buzz to it and is a fine accompaniment to lamb chops but might not handle a really mature steak or spicey callos. The only other criticism is that it is absurdly easy to drink – which in a 19 proof beverage is a recipe for a hangover!